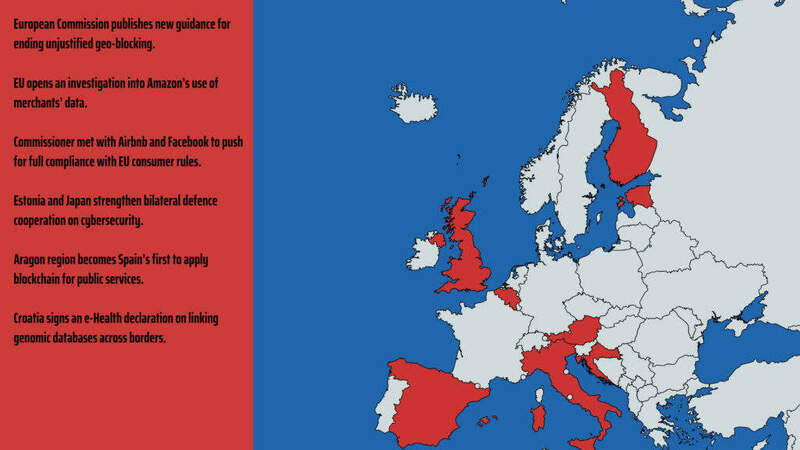 Welcome to this edition of Europe’s Digital Agenda. 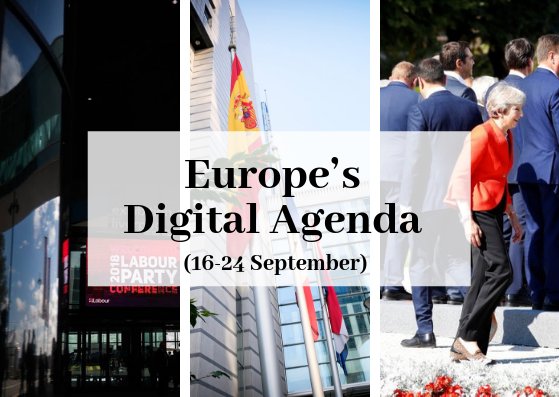 In this space we uncover and detail last week’s digital developments from across Europe, highlighting the most relevant news as well as EU institutions’ forthcoming activities, together with a focus on AI funding opportunities from across the Channel. Last week, we discussed key developments around the controversial EU Copyright Directive as well as key developments around Cybersecurity with a hack on an Italian agency, Brexit and the Pentagon’s commitment to invest $2bn in AI, which necessarily shines a light on Europe’s own AI journey. This week, we have a busy agenda that includes developments in EU investigation into Amazon’s use of merchants’ data and new Commission guidance for ending unjustified geo-blocking across Europe. We will also discuss Brexit and key developments around Cybersecurity with Estonia and Japan strengthening bilateral defence cooperation on cybersecurity. In this edition we will also present a look at The Week Ahead where we will help you decode the future by outlining the next week’s most relevant digital meetings and events. European Commission publishes new guidance for ending unjustified geo-blocking. The Commission has issued an updated guidance for ending unjustified geo-blocking to help member states to adapt to new rules which start to apply across the EU as of December 3. The new piece of regulation aims to allow European consumers and business to buy and sell products and services online more easily and confidently across the EU. A new questions and answers document on geo-blocking is also set to help member states to ensure a “smooth start”, by providing practical assistance to consumers, responsible authorities and traders. EU opens an investigation into Amazon’s use of merchants’ data. In a press conference in Brussels, the EU’s competition commissioner, Margrethe Vestager, confirmed that the Commission had launched a preliminary investigation into how the ecommerce group Amazon was using data from third-party sellers on its platform. It is not yet a formal inquiry, she added. The Commission suspects the e-commerce giant of using the data it collects from third-party vendors on its marketplace to gain a commercial advantage. “We have no conclusions, we haven’t formally opened the case, but we are trying to make sure that we get the full picture because we saw it in our own sector inquiry and this is also what a lot of people are talking about by now, so we do the follow-up,” Vestager added. The EU’s competition commissioner is already known for having a track record of “taking tech companies to task”. Just few months ago, she handed Google a fine of £3.8bn for anticompetitive practices related to its Android operating system. Commissioner met with Airbnb and Facebook to push for full compliance with EU consumer rules. European Commissioner for Justice, Consumers and Gender Equality Věra Jourová and national consumer authorities met with Airbnb and Facebook to take stock of the progress made on two ongoing consumer enforcement actions. Following the call from the EU consumer authorities in July, Airbnb has committed to “making the necessary changes to their terms and conditions and improving the presentation of their prices”. The company has until the end of 2018 to make these changes. Estonia and Japan strengthen bilateral defence cooperation on cybersecurity. It was also announced that Japan is preparing to join NATO’s Cooperative Cyber Defence Centre of Excellence, in Tallinn. Aragon region becomes Spain’s first to apply blockchain for public services. The autonomous region of Aragon, in northeastern Spain, will be the first in the Iberian Peninsula to adopt and apply blockchain technology for public administration. Gernando Gimeno, the Aragonese councillor for Finance and Public Administration signed a contract with Alastria – a blockchain ecosystem of more than 274 entities, which includes public companies, public administration departments, and educational institutions which have been working on developing blockchain-based tools in accordance with EU legal frameworks. Gimeno said that blockchain technology will improve transparency and increase accountability, thus leading to improved efficiency of the administration. The Aragonese initiative has not gone unnoticed, with Catalonia also expressing its interest for blockchain to assist its administration. Croatia signs an e-Health declaration on linking genomic databases across borders. Croatia became the 17thEU country to sign the European Declaration on linking genomic databases across borders. Shadow Cabinet Office Minister Jo Platt, “Let’s use the great challenges of cyber security as opportunities for our country”. As the Labour Party conference continues in Liverpool, Shadow Cabinet Office Minister Jo Platt says the UK can lead the world in cyber security. But argues the necessary leadership and collaboration have so far been absent. The Prime Minister’s senior ministerial team remains fully behind her Brexit proposals, Theresa May’s spokesman said, after her plans were criticised by European leaders at a summit in Salzburg last week. “The cabinet gave its full support to the white paper, and that continues to be the case,” the spokesman said. European Council President Donald Tusk said a compromise with the UK is “still possible”. Tusk issued a statement on Friday, a couple of hours after Theresa May delivered a speech in Downing Street in which she said the EU’s rejection of her Brexit plan without offering alternatives was “unacceptable”. Tusk said that EU leaders at the Salzburg summit had treated the proposals with “all seriousness” and said that there were “step in the right direction”. “Britain had known about the EU’s reservations over the Chequers plan for weeks,” he added. Labour said it will adopt a stance on its support for a second Brexit referendum by conducting a vote among members on Tuesday on a motion committing the party to support “all options remaining on the table, including campaigning for a public vote” if no election is triggered by May’s Brexit plans. Labour’s potential backing for a new Brexit referendum will be conditional on whether the Prime Minister fails to receive the support she needs for the Chequers proposal in the Commons. In the meanwhile, a group of eurosceptic Tory MPs have supported the Institute of Economic Affairs’ (IEA) Brexit plan, which would see the UK try to copy a ‘Canada-style’ free trade agreement on goods and services with the EU. The IEA plan also includes sticking to the arrangements already made with the EU on the £39bn divorce bill, EU citizens and the transition period. As the Labour Party conference continues in Liverpool, Shadow Cabinet Office Minister Jo Platt says in an article on Government Computing that the UK can lead the world in cyber security. But, she argues, the necessary leadership and collaboration have so far been absent. The European Parliament Committee on Industry, Research and Energy to host a workshop on Brexit, industry and space policy. Labour Party Annual Conference in Liverpool. European Parliament Budgets Committee to adopt its proposed figures for the EU budget for next year. Theresa May to give a keynote at the United Nations General Assembly (UNGA). UK Labour Party Annual Conference in Liverpool. European Parliament to host a conference for fact-checking organisations ahead of the upcoming EU elections. Second day of the European Parliament conference for fact-checking organisations ahead of the upcoming EU elections. Mayank Prakash, chief digital officer and CIO of the Department for Work and Pensions, is leaving to take up a new role outside government. Aalto University Foundation (Finland) has issued a tender to find a competent long-term partner to “fulfil Aalto level need for developing and improving the analytics competence of mainly unstructured data”. The partner should also be capable of combining unstructured and structured data for analytics purposes. The partner will provide technology, tools and competence to guide and teach Aalto specialists to manage data. The authority said in the procurement notice, “Data analytics is of strategic importance for Aalto and on national level, since it enables management by data, AI (Artificial Intelligence) science and IoT (Internet of Things) data repository and thus provides direct solutions to Aalto strategic ambitions to be a world class University”. The Cybertech Europe conference aims to present commercial problem solving strategies and solutions for the global cyber threat that meet the diverse challenges for a wide range of sectors: finance transportation, utilities, defence, R&D, manufacturing, telecommunication, health and government. Speakers include: Olivier Onidi, deputy director-general for security – European Commission DG Migration and Home Affairs; Alessandro Profumo, chief executive of Leonardo; and Eugene Kaspersky, chief executive of Kaspersky. During the two days conference, organised by the Dutch Ministry of Economic Affairs and Climate Policy and the National Cyber Security Centre of the Ministry of Justice and Security, leading speakers will share insights and developments in cyber security. The ‘it-sa’ is one of the largest IT security exhibitions in Europe with 630 exhibitors and over 10,000 attendees. Think Digital Identity for Government is the must attend event for professionals involved in Identity across government and for department heads and policy and decision makers from within local and central government.